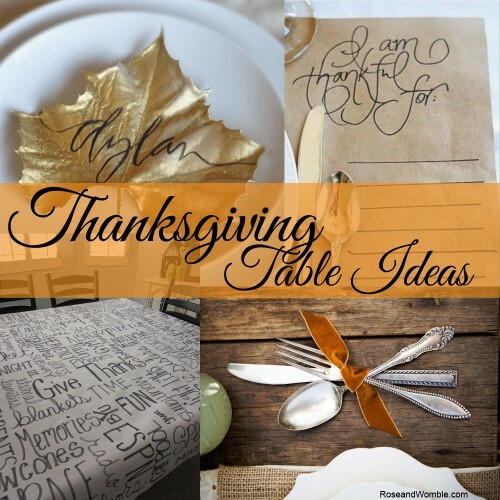 Great Ideas for Thanksgiving Table Settings - Rose & Womble Realty Co.
Thanksgiving is the ultimate family dinner and that including having a beautiful table to bring family and friends together. We’ve collected some great ideas from our Pinterest page but here are a few of our favorite ideas. The utensil holder download prints 2 per page and is so easy to make – just cut it in half (vertically), glue the edges and wait for them to dry. Voila! You may also embellish with some lace, burlap flowers or even plastic berries. Simple homemade place mats that could begin a tradition. Wonderful idea. After dinner you can sit and eat coffee and desert while the hosts read aloud what guests have written. These use butcher paper and a metallic pen. This could be the start of a new tradition for your family. Photo and idea courtesy of whimsicalhomeandgarden.com. What a terrific idea to use up those pumpkins – especially since Thanksgiving is so late this year. Festive, disposable, and unexpected. Go on Pinterest and type in Thanksgiving Place Card and you come up with so many ideas – but these were our favorite. Take leafs and spray paint them with gold paint, then use a paint pen to write names. So elegant and easy. You could customize this look with different paint, but we really enjoy the gold. Photo and idea courtesy of ElementsofStyleBlog.com. Seriously if you can tie your shoes you can do at least this. What a smart idea. Nothing simpler – just find some great ribbon and delegate this to your kids. Photo and idea courtesy of HomestoriesAtoZ.com. This is the most time consuming project but it could last generations. Using supplies from the hardware store you hand write words and things you’re thankful for. This is a truly customizable piece. Not every Thanksgiving will have a formal sit down dinner. If you’re hosting a buffet why not use this free printable to let guests know what yummy dishes you’ve prepared. This is one of those, “why didn’t we think of it first?” Taking walnut halves and using them as individual salt and pepper holders at each place setting. You probably don’t have to come out of pocket for this. Send the kids out a few days before Thanksgiving to find leaves – wash and dry well. Then put in the wine glass with a napkin. Where Does the Fork Go? We found this great infographic to show you how to properly set the Thanksgiving table. Celebrating the Brave Men and Women of the USMC!